“Parenting” begins with something we call “labor” and the work never ends for at least two decades. In many ways, “parenting” and “working” are synonyms. 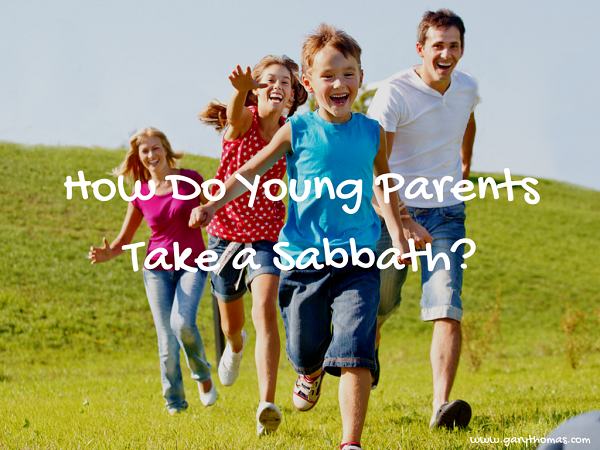 You can’t stop being a parent when your kids are young, so how can the two of you possibly enjoy a Sabbath? Unless you have a nanny, you obviously can’t refrain from changing diapers, giving baths, etc. But you can set some ground rules to give yourself at least more of a day off. In his helpful book 24/6, Dr. Matthew Sleeth mentions a mom who sets out special cinnamon “Sabbath bread” on Saturday night. 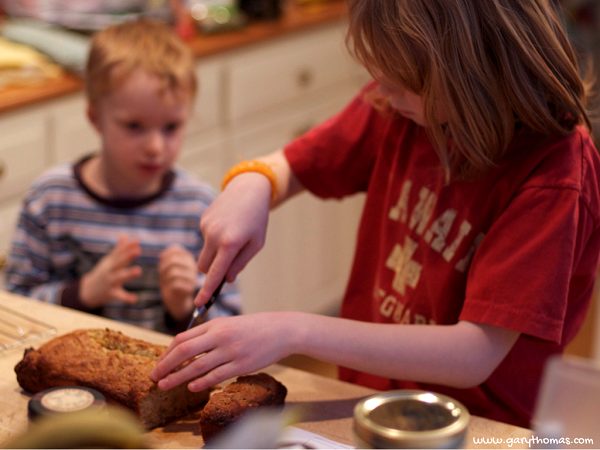 Her oldest daughter, a 7-year-old, can read the instructions to fix herself and the two younger siblings (5 and 2) a simple breakfast (cutting corners one breakfast a week won’t hurt anyone). After that, the kids play with a special box of “Sabbath” toys—set aside only for the Sabbath—so that the parents can sleep in. The “exclusivity” of the toys (only allowed one day in seven) makes them all the more desirable and tends to keep the kids away from the master bedroom. Things like this may not always work, but they work most of the time, and one morning with extra sleep can mean a lot to young parents. The Israelites prepared food ahead of time for the Sabbath and so should we—either frozen meals prepared earlier in the week, meals fixed the night before, or very simple meals that don’t require much work served on “dishes” that can be thrown away instead of cleaned. The rest of the day, this same family has a big get together for lunch with their extended family. This means the cousins are playing with each other while the adults can catch up and talk. The meal is simple and shared, with easy clean up in mind, so it doesn’t feel so tiring (you could do this with a Bible study or small group if you don’t have extended family members nearby). The evening dinner is also simple, low-maintenance, and the kids have an early bedtime. Because it’s always been this way (early to bed on Sunday), the kids don’t question it; it’s just what they do on Sundays. And the two parents say that Sunday evening is the highlight of their week. What Dr. Sleeth was telling his family is simple and profound: if your kids are too busy to keep a Sabbath, then they are too busy. Honoring God’s wisdom when the kids are young trains them to set priorities as adults. If we can’t do everything we want and keep a Sabbath, the call is to give up something else, not the Sabbath—but don’t most families choose to sacrifice the Sabbath? For our kids, Saturday was usually a better day to take off than Sunday. We still went to church on Sunday, but that left plenty of time for them to do their homework in the afternoon and evening. There’s no law that says the day you go to church has to be your day off, and with teens, they often needed Sunday evening to get homework done before the school week began. Once a month, it’s a good idea to consider giving the husband or wife a three hour window while the other spouse stays home with the kids (so you’re doing this twice a month, actually). For some spouses, getting completely away, without a chance of being bothered for three hours, can do far more than the other 21 hours will, even if it’s only once a month. If you’re not convinced that the Sabbath is all that important, that it tends toward legalism, I’d encourage you to pick up Dr. Sleeth’s book, 24/6. It’s well-written and compelling and I was convicted that I haven’t been as serious about the Sabbath as I should be. The Sabbath is about living a more ordered life of peace, joy, connectedness, and contentment. It reminds us of God’s sufficiency and care. If, like many families, you’ve begun to think you can live without it, I’d urge you to at least consider why God spends so much time talking about it in Scripture. We’re getting a lot of readers lately, so please feel free to share some of your own Sabbath- keeping ideas below. One response to How Do Young Parents Take a Sabbath? I hear His voice more clearly when I get still…but I will admit, I have to make an effort to do so because I equate being still with being unproductive and my level of productivity is directly connected with my perceived value..
Oh but I am learning, and allowing the Spirit to do his work in my heart!